Goju-ryu has several folklores on its root. Strangely, the correctly name of Higaonna's Chinese master is not unknown. It is said that the name was "Ru-Ruko" or“Tu-Ruko".But they are quite different in meaning though their pronunciation seems alike. “Ru-Ru” is the nickname of Higaonna when he was in China The "Ryo" of Kanryo is pronounced "Ru" in Chinese. It is presumed that his nickname "Ryu-Ryu" was made from "Ryo" simply spoken two times. 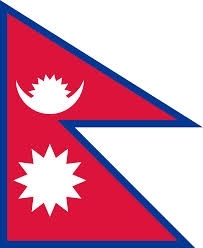 Historical actual existence can be confirmed to Tu-Ruko. Tu-Ruko is the Chinese martial artist "Jeng Lai-Gung" .He was the expert of "Bai He-Quan".It might be certain that he was one of the originators of GoJu-ryu. However, he is not the founder itself. It is presumed that the following six requirements complete Gojo-Ryu and/or Okinawan Karate. ① Kempo that existed in Kume Village in Okinawa from 1392. ② Kempo of “Wai Shinzan” who came from China in the 19th Century. ④ Techniques that Miyagi learned in China 90years before. ⑤ The technique originally developed by Miyagi. ①Many scholars and professional skill person's groups came from China to Okinawa by the Chinese emperor's instruction in 1392. They came from Fuzhou in Fujian in China. And, they settled down in the kume village in Naha ,the maximum trading port town. They were called "the 36 families in kume-village(久米三十六姓)". By the way, the word "36" is a metaphor of "so many". Each family was a professional ability group to hand down the high expertise such as study, art, diplomacy, literature, engineering works, the building to. The special ability of each family is business of the transmission from father to son.Do you think that they share their special ability to an outsider? Karate is also one of such special abilities. Of Karate is secretiveness inherently. Gojuryu certainly has the technique and the theory based on the philosophy and the medicine of the deep Orient more than the imagination. Afterwards, their descendant was the leader layer of diplomatic and of trade between China and Okinawa for 500 years. In the Goju-Ryu DOJO that values the tradition of Okinawa,the martial arts god "Kyu,Ten,Fu, Ka, In, DenTo,Gensui" (九天風火院田都元帥)is enshrined. It is the god of the folk customs belief (taoism) imported from China by them. “Wai Shinzan” was Chinese martial artist and teacher of Aragaki Sesyo (teacher of Higaonna Kanryo). His real name was Wang Daxing (王打興：1793?~1894?). He came to Okinawa twice, once in 1838 and once in 1866 as the military arts executive accompanying representatives of the Chinese government. The pronunciation “Wai Shinzan” originates from “Wang Shijiang：王師匠” (meaning; Wang sensei). Wai Shinzan had kept close relations with Shihan in Okinawa. 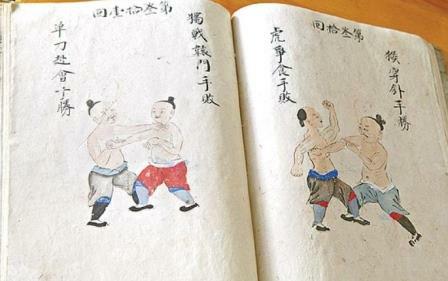 In the famous martial arts book “Bubishi”, mainly handed down to Gojo-Ryu, his philosophy is recorded .In this book,he was introduced his pen name"Wang Yuedeng王登岳.” (“Bubishi” can be called the Bible of Gojo-Ryu.) He can be regarded as one of the founders of Gojo-Ryu. Matsumura Sokon, however was his student too, and his influences are also seen in Syuri-De (the roots of Syotokan-ryu and Shorin-ryu and Tomari-De. For example, the names of kata such as “Wankan”, “Wansyu”, and “Unsu” originate in the alias named Wang Shijiang. “Wankan” is the shortened form of “Wan-Bukan王武官”. The bukan means the“martial bureaucrat.” “Wansyo” is the shortened form of “Wang Shijiang” (meaning Wang sensei). Unsu is the one that is the shortened form of “Wang Shijiang” and the pronunciation has changed. Incidentally, he was a famous martial artist in the Chinese “White Crane Kung Fu”. As a result, Karate was influenced from this type of Kung Fu. “Tou Ruko” is presumed to be Higaonna Kanryo’s teacher. Of course, this pronunciation is in the Okinawan language. Therefore, there are various theories about “Tou Ruko.” What does “Tou Ruko” have to do with the roots of Gojo-Ryu being similar to Wai Shinzan? It is presumed that he was Ton Lee-Kun"鄭礼公", a Chinese expert of “Fujian White Crane.” More specifics about Ton Lee Kung will be presented later. Kanryo Higaonna had three famous students -- Juhatsu Kyodo, Chojun Miyagi, and Seiko Higa. 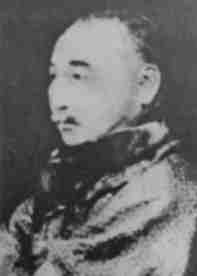 Juhatsu Kyodo is the first teacher of Kanki Izumikawa. (He was the oldest student of Seiko Higa.) Higaonna handed down four katas: Sanchin, Sesan, Sanseru, and Bettyurin. Bettyurin is assumed to be an alias of Suparinpei. There is the proven documentation that these kata had existed in Okinawa before Higaonna. It has been believed Higaonna stayed in China for 10-30 years and learned Kung-Fu from the master named Tou Ruko (Ru Ruko). Recently, however, there is a new theory that hislength-of-stay in China was about three years, and his purpose was business. My master said there is no proof on Ru Ruko. Sometime,I heard that Higaonna certainly went to China.And he helped one child from big flood. So he came to learn Kung-Fu from the child’s father, but there is no proof that the father’s name was Tou Ruko.In old China, a young man was called his name's last character repeated twice. In that case, Higaonna Kanryo would be called Ryo-Ryo or Ru-Ru. I convince that the name "Ru-Ruko" is not the name of Higaonna’s master but the Higaonna's Chinese name. In a word, Chinese name of Higaonna may have been misidentified with his master’s name. Nowaday some Karateka come to China to look for the evidence of Ru-Ruko. And,of course, the master Ru-Ruko hadnot discovered. What they are really arguing about is misunderstanding when they discover a Chinese master with a name that looks likes Ru-Ruko. However, it is just a fantasy because the Kung-Fu correspond to Gojo-Ryu hadnot identified at all. By the way,the name “Tou Ruko” had been memorized by Higa Seiko. 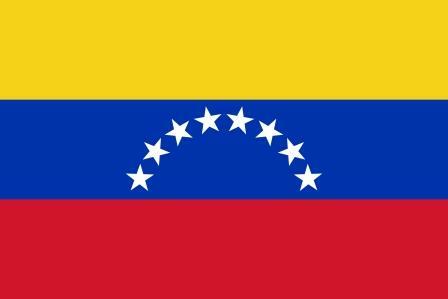 Therefore, his reputation has not been compromised according to these facts. Higaonna certainly revived the Naha-te that had gotten lost,and handed downit to future generations. As a result, Gojo-Ryu exists today. He was the oldest student of Kanryo Higaonna.He founded Touon-Ryu from the difference of opinion with Miyagi. "Touon" is Higaonna variant pronunciation.Kyoda is the successor with accurate technique of Kanryo Higaonna. He is not modifying the technique of Kanryo Higaonna at all.KATA that he passed on to future generations is as following six . "SANCHIN,SESAN,SANSERU,BETTYURIN,JION,NEPAI"
He learnt JION from Kentsu Yabu(1866-1937) ,and NEPAI from Kenki Go(1886-1940). Therefore, KATA that Kanryo Higaonna owned is only four (SANCHIN, SESAN, SANSERU, and BEECHURIN). Moreover, common KATA to both has many difference. He criticized the trend of Chojun Miyagi and Goju-Ryu at all. He might have known various secrets concerning the Gojuryu birth.When his record and KATA of Touon-ryu are analyzed, it is guessed that Miyagi added a lot of improvements and additions to Karate of Higaonna. Such Miyagi's act seemed to be unpleasant for Kyoda. It was natural that he had made the university student a customer for the social position improvement of Karate. Karate could get a credit from the nation only by becoming the school physical education subject. 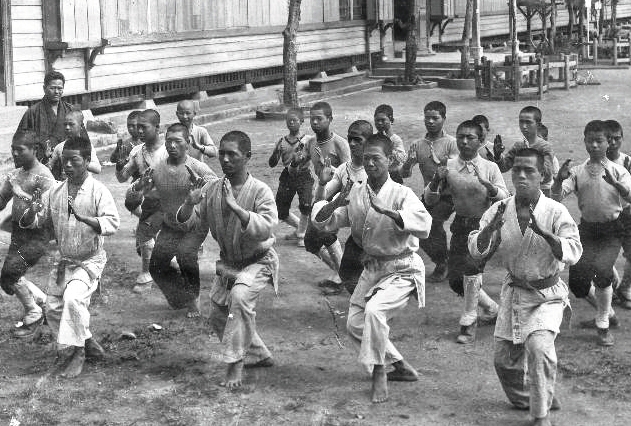 Syurite-Karate was alredy became the subject of the physical education in the secondary school in Okinawa from 1905. "Heian(Pinan)1-5" are the KATA that Anko Itosu created as the teaching material for the school student at this time.Moreover, Gichin Funakoshi who was the student of Anko Itosu, migrated to Tokyo in 1922, and had taught Karate to a lot of university students. By the way, "Syoto" is the town name he lived.Naha-Karate had been greatly delayed starting compared with Syuri-Karate. On the other hand, because he was a Shihan of Naha commercial high school,Miyagi brought up a lot of students in Okinawa. Miyagi expanded upon the Karate of Higaonna, adding new and original elements to it, resulting in the completed form of Goju-Ryu. The name “Goju-Ryu” was designated by Sinsato Jinan(1901～1945)who was his best apprentice in 1929. He was a pure Samurai,Budo-ka.He completely had no interest in political science of his organization expansion.And he was likely to be available person because of naive.He prohibited to his pupils to get a living by Karate .He didn't issue the title,Dan,Hanshi,kyoushi and Renshi at all.But his pupils established big Dojo,big organization and ran to politics and business.That is the cause of the confusion of today's Gojuryu sect .In later life,he was only Kancho of a small Dojo.In the sense of business, he was misfortune.But nowaday,his fame is resounding all over the world. 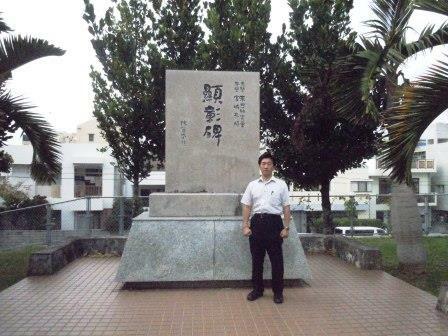 In the place (Kume town, Naha city) where Goju-Ryu was born, there is a commending stone monument dedicated Kanryo Higaonna and Chojun Miyagi. Needless to say, they are initiators of Gojuryu. 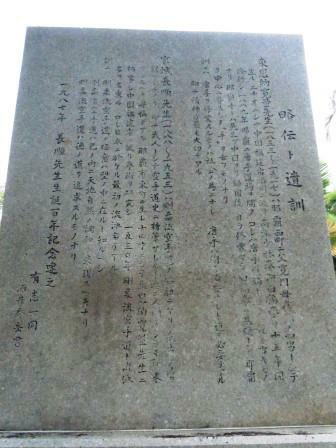 Three important messages from Miyagi had been carved for the other side of this monument. 1　We should know that a secret of Gojuryu Karate exists in Kata. 2　We should achieve a harmony of nature inside us by Gojuryu Karate . 3　We should pursue a moral character by Gojuryu Karate . This monument had built in the birthplace of Nahate-Gojuryu. This place was called kume village in old times. The village was immigrant's　village from China in 17 century. Martial arts that they had brought from China became prototypes of Nahate-Gojuryu. Gekisai1, Gekisai2, and Tensyo was Miyagi created. Higaonna's Suparinpei was handed down as Suparinpei which was improved and corrected by Miyagi. Higaonna did not teach the kata named Suparinpei. The Bettyurin Higaonna taught is maintained in Touon-Ryu of Kyoda today. Shito-Ryu also has the Suparinpei kata. And the kata is calledas Bettyurin. That kata is, however, the same as Superinpei of Goju-Ryu. It is clearly different from the Bettyurin kata of Touon-Ryu. Where then did Saifa, Seienchin, Shisouchin, Sepai, and Kururunfa come from? It turns out that there is documentation shows that Shisouchin existed before Higaonna. In the opening operation, Seienchin, Sepai, and Kururunfa do not have sanchin operation. 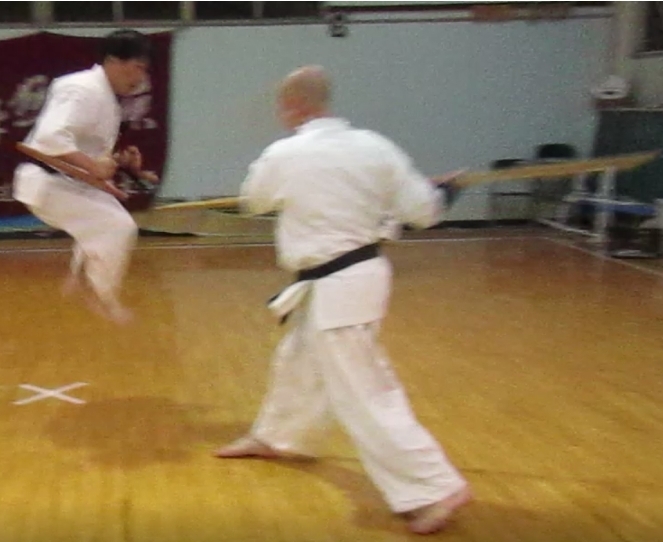 They are, in fact, obviously different from other kata of Goju-ryu. And these kata donot exist in Touon-Ryu of Kyoda. This means that Miyagi had had another teacher besides Higaonna. Who was he? It is presumed that the person who taught these kata to Miyaga is Motobu Choyu (1857-1928).Two or more testimonies exist about this. Motobu Choyu was a member of the royal family in Okinawa. This means he had access to many great masters of excellent studies, martial arts and arts from an early age. Moreover, he was a great master of “Udon-di” that was handed down through the royal family. 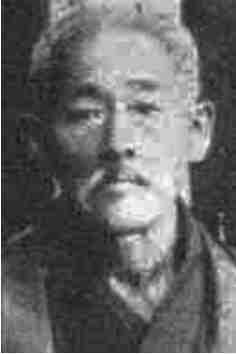 Motobu Choyu (1857-1928)formed the "Okinawa Karate Research Club" in 1923 as a joint Karate research organization. As a result, a lot of famous Karate masters participated in the club. It so happens that Miyagi Chojun and Mabuni Kenwa took active roles as members in the club staff. 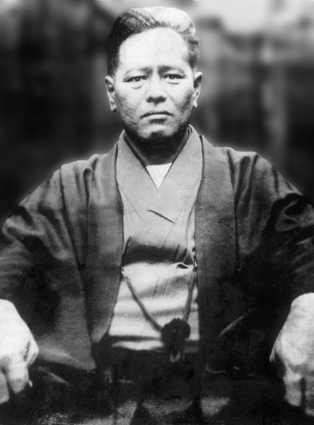 Motobu maintained several kata that were able to be known through association with the royal family, Miyagi Chojun learned many of the kata from Motobu. It is believed that Saifa, Sisouchin, Seienchin, Sepai, and Kururunfa came from Motobu because the kata all share similar techniques including joint locks, chokeholds, tighten holds, grappling holds, and throws that are common elements of Udon-di. Motobu endeavored to advance Okinawan martial arts until his death in 1928. Another important person with roots in Goju-Ryu was Kenki Go(1886-1940). Kenki Go was a naturalized person from China, and his martial arts lines are of Fujian White Crane. Chojun Miyagi was always interested in this technique. His strong influence can be seen in Tensyo and Suparinpei. The “Kakufa” kata from Go Kenki is maintained in Higa Seko’s Goju-Ryu as a secret Kata. It also appears that “Yantu” from Mas Oyama’s (Kyokushin’s) kata is along the lines of the same Fujian White Crane. 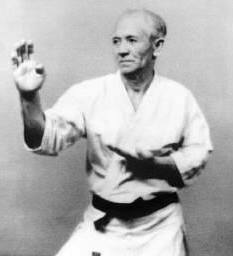 Mas Oyama was from Goju-Ryu. 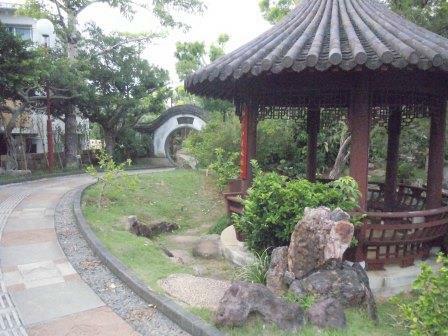 It is said that he learned Kata Yantu in Taiwan. Kenki's father, Kouki Go lived in Fujian, China and was a trading merchant. And he was a go-between of Karateka's study in China. 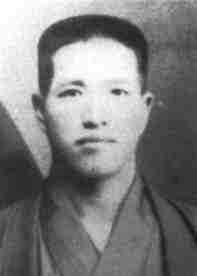 Shinko Matayoshi(1888-1947) who was the founder of KimGai Ryu became a disciple of the KimGai master by his mediation.The KimGai master was a senior of Syu Shiwa who was the master of Kanbun Uechi(1877-1948) who was the founder of Uechi Ryu. By the way, Kim of KimGai means a gold, symbol of "Softness". Gai means "hard" in Chinese.Therefore,the meaning of the word KimGai is same as Goju ryu,"hard" and "soft".The relation between commonness of Gojuryu, Uechiryu ,Ryueiryu,Kimgairyu that has same category of Nahate is interesting. Seiko Higa(1898～1966) was the relative and the last student of Kanryo Higaonna. 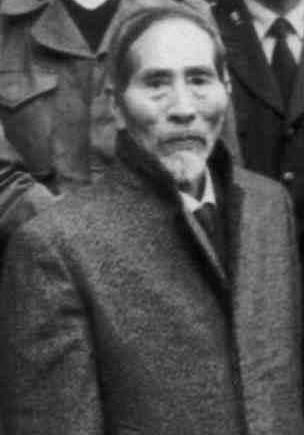 And he studied under Chojun Miyagi who was the senior pupil at the time of the death of Higaonna,too. The idea and action of of their Karate, however, were considerably different. 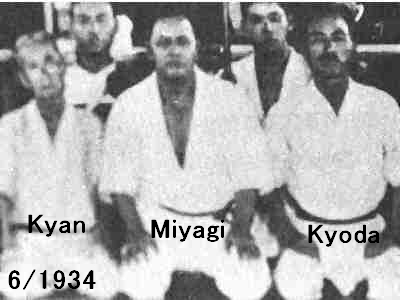 Chojun Miyagi thought of Karate as physical education, equal with Judo and Kendo. Because he valued the school education. The first people he taught in Japan proper were university students who were part of the elite social class. In contrast, Higa started succeeding to Naha-Di as a martial art with the center of his activity being Okinawa. 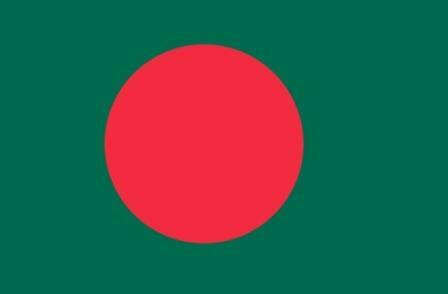 Japan entered into World War II in 1939. Okinawa became a burnt ground by this war. Many Karate experts died. And Okinawa was occupied until 1972 by the United States. 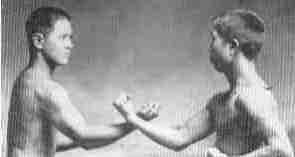 Karate and Gojuryu were divided to innumerable sects. The confusion of today's sect is caused by war. The war really produces only misfortune. 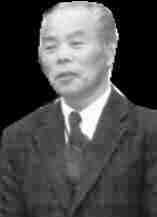 Kancho Omoto has been guieded Karate by Shihani Naganuma since 1973. When he acquired his Black Belt, the Karate of Japan was facing an important pivotal turning point. There was a movement of integrating a fusion of various Kata, from various family trees within the curriculum of traditional Karate, into the Japan Karate Federation (JKF). Furthermore, though these Kata were similar in name and sometimes employed similar movement, the true interpretation and application of the Kata,in many cases, has become widely misunderstood. The results of Omoto ’s path, his choices, and his lifelong research are the subject matter of this website. He lectured in Philosophy as a high school teacher for 35 years. During the time period, he has also carefully guided and brought up generation after generation of high school students, athletes and Karate enthusiasts. From 1993 he has at a adviser of WBKL Furinkazan fullcontact Karatedo. He was going to inspect whether Gojuryu really worked for every other martial arts with his body. Kancho Omoto's students have made extraordinary efforts, and acquired victories and various awards in the All-Japan Championships, the Tokyo area Karate Championship, and various municipality district championships. Some of them have become excellent Karate instructors. By the way, Karate in which Kancho guided at his high schools was JKF style according to the rules for high schools in Japan.
. Because Kancho has strongly felt the necessity for the preservation and succession of old type Goju-Ryu, and he sincerely believes in the need for accurate philosophical and spiritual research on Karatedo, he has been teaching a special course in Goju-Ryu and Kobudo at his YUZENKAI Dojo. He also feels that the current study of traditional Japanese Karate lacks the proper philosophical and ethical research as well as true perspective. Through the Goju Ryu International KarateDo Kobudo Union and the Japan International KarateDo Kobudo Union(GIKKU), Kancho Omoto, since 2013, has started to “spread the fruits” of his 42 year journey of sincere study in Gojuryu Karatedo Kobudo to people in countries outside of Japan “by his own hand”at the same time as being authorized as Hanshi9thDAN in GIKKU. This word "Nahate-Gojuryu"is not a word that indicates the RyuHa name (style name). This is a word that shows Yuzenkai's vision and mission. We are not trying to add a new novel style. We obtained the following conclusions as a result of researching Goju-Ryu for years. 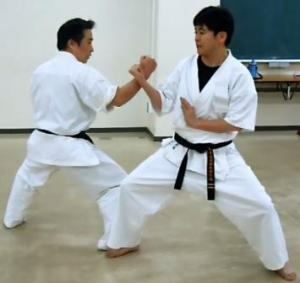 It is necessary to understand GojuRyu in terms of the Nahate category.In the Karate that belongs to the Nahate category,there are GojuRyu,TouonRyu,RyueiRyu, and UechiRyu.These Karate are in kinship, and their principle and combat thought are common.Especially,GojuRyu, ToonRyu, and RyueiRyu have a common founder named Tou Ryuko(Ryu-Ryuko). 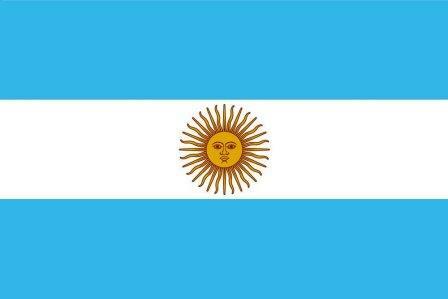 We arepaying deep attention to this respect. (However, there is a difference betweenthem concerning the legend of RyuRyuko. ); And in these Karate, common KATA exists. For instance, SESAN and SANSERU exist in all. SANCHIN exists in GojuRyu, ToonRyu, and UechiRyu. SEIENCHIN exists in GojuRyu and RyueiRyu.Of course, the same name KATA has some subtle differences. However, these differences are not essential. Furthermore, the difference becomes an important hint to interpret each KATA. We thought that it was of the greatest importance to recognize GojuRyu in the Nahate category. Four predecessors (schools)chose Nahate because of experience and the aspect, and　GojuRyu.ToonRyu,RyueiRyu,and UechiRyu were created.To understand the truth of Gojuryu, We strongly believe that the same thinking in reverse, conversely, is necessary now. To understand the United States early history and culture, we would also have to know about the history and culture of Spain, Britain and France among other countries.Therefore, we choose to reexamine GojuRyu from the Karate category named Nahate.Nahate GojuRyu is a word that indicates such a vision and the mission. However, the truth of GojuRyu is meaningless if not verified by the combat of the reality. We must not, however do real combat in our Dojo to understand this. We also think that the verification of the truth is impossible in Yakusoku kumite. YUZENKAI has devised Jiyu Kumite unlimitedly similar to the actual combat of GojuRyu for that. It can likely to be called, so to speak, full contact GojuRyu. 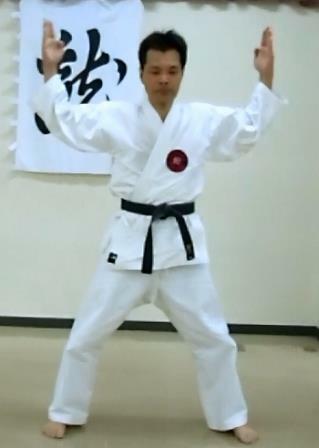 YUZENKAI is the succesor of the traditional technique of GojuRyu as a technique that can be used with free Kumite. We are devising full contact Kumite and light contact Kumite to use the technique in the GojuRyu 5 field composed of striking techniques;joint locktechniques;throwing,constriction techniques and　grappling technique development. The real value of Gojuryu cannot be verified by the WKF method and the full contact method. We are learning and studying traditional Kobudo. In the school training and teaching to boys and girls, we guide sports Karate that values our basic　philosophy. We strive to recognize overseas international Dojo to study Karate Kobudo as our partners. And, as they may feel necessary,we will assist in confirming and issuing DAN rankings according to their study results. For these Dan rankings, we will compile the appropriate curriculum, the syllabus, and contents. 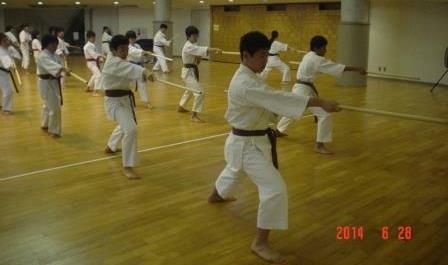 Moreover,YUZENKAI has enter a new stage as Trinity of GojuRyu, SyotokanRyu, and Kobudo. Along with this, we have set up the Japan International Kartedo Kobudo Union YUZENKAI. We do not hope for the expansion of the list of names (quantity).WeI would like to invite those who research KARATE from various aspects together. We also especially want to contribute to the region of developing countries where Japanese Karate Instructors were not previously available. Now,after retired from a high school vice principal at 2018,Kancho Omoto devotes himself to an activity of Yuzenkai while he works as the special lecturer of the high school and it's Karate club.